Gustav Mahler: Symphony #7 in E minor "Song of the Night"
As Sir Simon Rattle prepares to end his occasionally controversial tenure with the Berlin Philharmonic (everyone's is, so he's hardly alone), the University of Michigan grabbed him and his orchestra for two evenings in Ann Arbor at Hill Auditorium. While I have read a good deal of both positive and negative press about the conductor, and have been lukewarm about his accomplishments on disc, I tried to approach these concerts with an open mind. As I said to a friend on Saturday, "I feel like the orchestra either is too homogenous or not homogenous enough." Concerning Rattle, I've often felt – perhaps unfairly – that he was trying to match the legacy of Herbert von Karajan without success. His 20th-Century advocacy is laudable with mostly excellent results. His forays into the standard repertoire impress me less. Not surprisingly, I heard things this weekend that support every one of these claims. Purely as orchestral sound, these two concerts are easily the two most beautiful I've heard in my life. The strings played with extraordinary passion, unanimity, and finesse, while also commanding a huge dynamic range. The winds and brass rang out passionately, without the slightest hint of stress or crudeness. There were moments where I simply sighed, for here is a world-class instrument that can turn on a dime. However, they are also very young players. This is not Karajan's or even Abbado's orchestra. At times, the ensemble sounds like a collection of star soloists. This works, and doesn't. It obviously did nothing for the lavishly packaged Schumann cycle on the orchestra's very pricy in-house label, and it didn't always – either here or on EMI – work for Brahms. But I found the Boulez (which like most of the late conductor's work strikes me as noise) and the Second Viennese classics to be clearly defined and well-suited to a large chamber-like feel. The Boulez opened the program on Saturday. If nothing else, it gave rarely heard instruments like the guitar a chance to shine on the concert hall stage. Believe it or not, the Berlin Philharmonic has a full-time guitarist in its ranks, and the full range of percussion instruments was also on display throughout the weekend. The Boulez was meant as a tribute to the conductor, but surely something on a larger scale might have been chosen for an international tour? Whatever the case, I must admit the work holds some very interesting aural effects. Rattle also seemed fully engaged in music that has a limited audience. The response was warm, if somewhat puzzled. However, the Mahler was the main attraction. 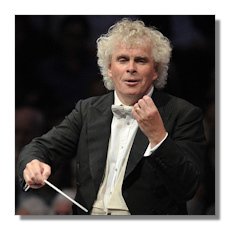 Rattle has recorded this work in the studio to mixed reviews, but one cannot question the response of his orchestra. With an almost machinelike savagery, the strings attacked the work, and again the brass and woodwinds are without peer. That said, the work is weirder than Rattle allowed in his interpretation. Minor details, like a slightly sluggish opening and some insufficient contrast within the inner movements, soured my impressions slightly. Both here and on Sunday, there was a little too much smoothness, or a feeling that everything was overly rich. However, unlike some of his outings on disc, Rattle mustered some exciting climaxes. Especially in the outer movements, the orchestra impressed by playing at full power without ever turning ugly. Ultimately, this was a fine display of orchestral virtuosity that said less about Mahler and more about the Berlin Philharmonic. On Sunday, the three major figures of the Second Viennese School came together on one program, along with their idol, Brahms. Rattle had some interesting remarks before the concert. Aside from choosing to play all three sets of pieces without break, he asked us as listeners to consider the music as an extension of Mahler's impact on Vienna. Although twelve-tone music is not my favorite (amusingly, my musician friends and I still called the program "very contemporary" after all these years), I did appreciate the parallel. The Berlin Philharmonic played beautifully, perhaps most wonderfully in the basically Romantic Berg. The Schoenberg and Webern are tougher nuts to crack, but they too were given committed and accessible readings. Rattle was totally involved, and I never got the sense that he or his ensemble were ever serving anyone but the music at hand. The Brahms was drop dead gorgeous. From a perspective of aesthetics, it doesn't get much better than this. This huge orchestra showed an ability to shift from the loudest fortes to the quietest pianissimos with minimal effort. Ravishing strings dominated the texture, and while not quite 80's Karajan in nature, the occasional overuse of legato was telling. Rattle had some problems in this work that had not presented themselves in the arguably more challenging modern works. For one, as impressive as those dynamic adjustments were, they were used more as an effect than as a foil for Brahms. Second, there were a few moments of poorly coordinated tempo shifts, or instances were Rattle and his orchestra were not on the same page. Finally, the third movement was simply too fast. All the pretty playing in the world cannot salvage an orchestra and conductor who rush. Simply put, these two evenings were ear candy. Rattle's strengths – for me – don't lie in the core German repertoire, but his passion for the Boulez and the "best of" twelve-tone music showed him and the orchestra in top shape. Though you could argue for a little more strangeness and abandon in the Mahler, and maybe more depth in Brahms, there was enough on display here to make most listeners very happy.